Confused? You won’t be once you start reading this fantastic book. Everyone you meet in the town of Blackbird will have you loving or hating them from the moment they step on the scene, and the town itself will show you that it has a story of its own to share. As things are getting to be too much for Seth, Blackbird takes it to the next level seemingly on its own. More Discordants are flooding the town, and the Five Penny is being overwhelmed by their influence in the absence of a Guardian. The Five Penny; that’s the bar where they work and live together, and watch over the activity of the Discordant. It’ll all make a lot more sense if you just read the book. Let me tell you why. 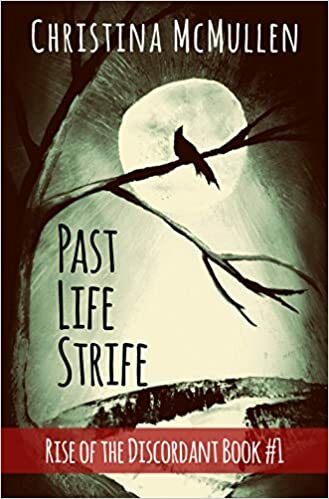 ‘Past Life Strife’ is not just a great book; it’s an intricately woven spell, cast from the very first page to the very last. Christina McMullen uses every word carefully and magically, so that a single sentence can say many things. The story pulls you ahead in about every way that a story can, and might leave you wondering if you missed something that was being said for all the other things going on. There’s no time to back up, though, and that’s okay; it’s so great that you’re likely to read it again. I myself have already scheduled my next trip to Blackbird. No matter what kind of reader you are, you should go there too. There’s bound to be something there for you that you didn’t know you were looking for. You’ll be glad when you find it. This book isn’t burdened with clunky philosophy or fluffy new age concepts; it isn’t weighted down by anything. If you’re into that sort of thing, though…prepare for a very rewarding Easter Egg hunt! I would be remiss not to mention one of my favorite aspects of the book, how well McMullen handles herself philosophically. It lends a depth and credibility to what would otherwise already be a screamingly fun and thoughtfully told story. It also makes you want to find out what happens next in Blackbird, and what more there is to learn about this mysterious town full of dark terrors and delights. ‘Past Life Strife’ is supernatural story-telling at its best, and anyone with a soul should read this book. I’ll see you in Blackbird! You’ll find Past Life Strife at the Kindle store and on Kindle Unlimited.